Campingplass Résidence du Banel er en campingplass i Matton-et-Clémency, Ardennes, som ligger i skogen og ved en elv/bekk. Denne campingplassen har steder med avgrensning, med skygge, uten skygge og plasser med noe skygge. Det er mulig å leie stasjonære campingvogner og hytter. Campingplassen har lekeplass. For sportslige feriegjester arrangerer campingplassen ulike sykkelturer. For dem som vil slappe av etter en travel dag er det sauna, boblebad og dampbad. Denne inspektøren besøker hvert år Campingplass Résidence du Banel og inspiserer campingplassen for ca. 200 fasiliteter og for andre punkt som forekommer. Inspektøren er en medarbeider fra ACSI og arbeider ikke for campingplassen. Quiet location. Late September almost empty. Individual facilities an unusual feature. Restaurant busy on Saturday evening and food good. Unable to find anyone to pay when leaving, so put money in a envelope in the letterbox at reception. Very pleasant village and pretty arboretum almost next door to the campsite. We loved this campsite. Private shower room was a first for us and really convenient. Lovely big pitch for our large tent. Excellent restaurant with a menu which suited all of us and good wine selection. The animals here also added something fun and unusual. The Owners have gone to a lot of trouble with their site. We will return! A lovely find for a stopover on our way to a classic caravan rally in Germany. Enjoyed the beautiful wooded surroundings, morning birdsong, spacious pitch, private bathroom and restaurant. 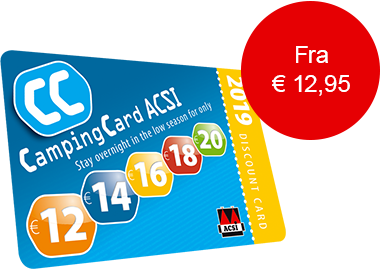 Great value using our ACSI card too. Beautiful area, lovely site individual toilet/shower/basin per pitch. Only downside was window fixed so no ventilation during use so led to build up of condensation and floor very wet, could do with a mop so you can sweep out access water when finised. Camp restaurant excellent, well cared for site very peaceful when we were there buitiful birdsong. A walk to village arboretum well worth it. Only downside was the local baker/shop/postoffice was closed on the both occasions we tried to buy bread, even though the sign said it should have been open, so we had to drive to local intermarche about 10 to 15 mins away. That said would definitely recommend, if only to listen to the beautiful birdsong. Vil du booke Campingplass Résidence du Banel eller få mer informasjon? Det går bra med opplysningene nedenfor. ACSI Eurocampings sender din forespørsel til "Campingplass Résidence du Banel".